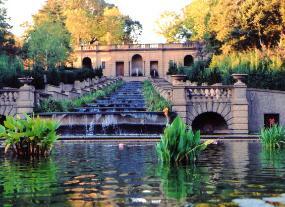 Meridian Hill takes its name from Thomas Jefferson’s plan to re-mark the Prime Meridian. Changing it from Greenwich, England to the road running parallel to Meridian Hill, 16th street, which intersects with the White House. Had Jefferson succeeded, we would have crossed time zones when we went across town for dinner. We got married in Meridian Hill Park, our favorite park in DC and just a few blocks from where we live together. It’s got everything we could ask for — terraces, statues and cascading fountains. If you ask us, it’s one of D.C.’s best kept secrets. Fun Fact About Meridian Hill Park: What a Power Couple! Mary Foote Henderson is responsible for lobbying Congress to construct and dedicate the land for Meridian Hill Park in 1888 and turning it into America’s First National Park dedicated to the Performing Arts. And her husband, a Missouri Senator, introduced the 13th Amendment giving African-Americans the right to vote. Who made this website? It is really nice!